The Recorded Sound Archives Research Station (RSA-RS) is an innovative and unique way for FAU’s Recorded Sound Archives to share its resources with other educators at various institutions and researchers around the globe. In the past special software was required to create a database search tool and classroom aid for researchers, teachers, and students of Judaic music, history, and culture. The archive has expanded to include vintage recordings from the earlier 1900s along with a Jazz collection. Digitized music files can be heard in their entirety in a non-downloading format along with record label scans and album cover scans are also provided. Music can not be downloaded from RSA-RS. In compliance with US Copyright laws only those individuals with a clearly academic or educational purpose may have access to uncut versions of recordings under copyright protection. Due to US Copyright laws, 95% of the recordings in the RSA’s extensive collection of sound recordings cannot be legally shared on our public website. 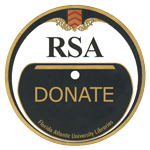 RSA-RS allows qualified academics and students access to a much wider range of materials. Many of these recordings are rare or historic. If you are not part of the FAU community and interested in gaining access, you may apply by visiting Research Station in the menu above.